Special:ProblemReports lists all reported problems. As an administrator on your wiki, you have the power to resolve problem reports. 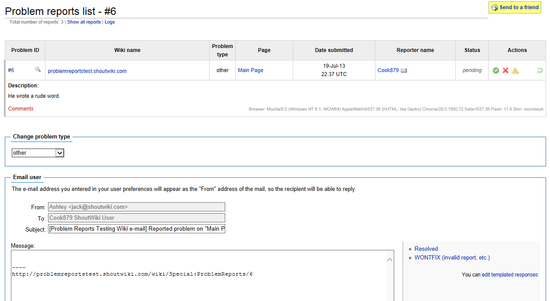 To view a list of reported problems on your wiki, go to Special:ProblemReports. Here you will be presented with a table of unresolved problems and the key information about where, when and by who they were sent. This list can be filtered by problem type by clicking on the categories along the top. To get a description of the problem, click on the magnifying glass icon. To find out the complete details of the problem, click on the problem ID. The complete details include the reporter's User-Agent string, which can be used to identify the reporter's browser and to resolve browser-specific problems, as well as the reporter's Flash version (provided they have Flash installed) and the skin they were using to view the page with. When you have the detailed problem report view (i.e. Special:ProblemReports/3) open, you can change the problem type if it has been mislabeled. For example, if a software bug report has incorrectly been marked as a content issue, you can use the "Change problem type" drop-down menu to change the problem type. If you have a problem report that you've resolved, you can mark it as resolved by clicking on the tick under the actions column of the table. If the problem report is wrong, for example a content correction which is incorrect, you can close it using the red X. If the problem is an issue which you can't resolve and which is requires staff assistance, for example a software bug, click the yellow triangle. If the problem report is a spam message, a personal attack or some other unsavoury content, mark it as requiring staff assistance and the staff will delete the report for you. It's best to notify the staff via the contact form about these kind of issues. If you want to discuss the problem report with other wiki admins or wiki users, when on the report screen you can click the comments redlink, which will create a talk page for you. If you need to ask the user for more information, the report screen has a box which allows you to send the reporter an e-mail message. The e-mail form is automatically preloaded with your on-wiki username, e-mail address as well as the reporter's username. The reporter's e-mail address is not available to you unless they choose to reply to your message. When such a template is clicked, its contents are automatically substituted (added) to the e-mail form, hence you don't necessarily need to type a lengthy response over and over again. Like moving and deleting pages, problem reports appear both on the recent changes feed and its own log, Special:Log/pr_log. All problem report actions, from the initial reporting to an admin changing the report's type, e-mailing the reporter or closing the report are logged into this log. The relevant log entries also appear at the bottom of the page, below the mailer form, when viewing the details of a problem report. As well as sorting by problem type as mentioned earlier, you can also view closed reports and reports that need staff help through the Special:ProblemReports page. That page will also link you to an RSS feed, if you want to keep track through an RSS reader. Also, individual reports have a log of changes to the report at the bottom of the page.